More than 40 plant species that have an edible nut are grown in Papua New Guinea (PNG). Many nuts are grown in small quantities in a limited number of locations. Thirteen species are grown in sufficient quantity to be classified as ‘important’, all of which are indigenous. Ten of these ‘important’ species, which are grown by more than 8% of the rural population, are described below. A number of nut crops have been introduced since 1870 and three of these – macadamia, cashew and pecan – are grown, but all are very minor foods. Five of the species discussed here are considered as having significant potential for commercial development for both the domestic and export market. These are galip, planted karuka, okari, pao and sea almond. Three of these are sold as processed nuts in modern packaging in Vanuatu. In the medium to long term, the indigenous edible nuts could be worth many hundreds of millions of kina to the PNG economy. Breadfruit has a number of economic products, with the flesh of the fruit and the nuts eaten. Other uses include medicine, timber, fuelwood, canoe construction, clothing, rope, wrapping and adhesive. Both the flesh and nuts are eaten on the smaller islands off the north coast of New Guinea, on the Admiralty Islands, the Bismarck Archipelago, the Solomon chain, and throughout Milne Bay Province. In contrast, only the nuts are eaten on the mainland of New Guinea, with some exceptions, such as the mainland of Milne Bay Province and some coastal locations on the south of Central Province. As well, types of breadfruit with few or no seeds have been introduced into PNG from Polynesia over the past century, but these types remain uncommon. The fruit is cooked, commonly in a stone oven, but there are numerous ways of cooking and preparing breadfruit. On Nissan Island, villagers preserve the flesh by roasting it to form a biscuit and this is said to remain unspoilt for several years. Breadfruit was domesticated by people in New Guinea, probably thousands of years ago. From New Guinea, people spread the species in pre-European times throughout the Pacific islands, as far east as the Society Islands, north to the Marianas and north-east to Hawaii. It was introduced into the Philippines in ancient times from Guam. Breadfruit has been introduced throughout the tropical world in recent centuries. In PNG, breadfruit grows from sea level up to a mean of 1250 m, occasionally as high as 1450 m, and is widespread throughout the Momase, Islands and Southern regions. It is also grown at lower altitudes in the highland provinces, up to about 1200 m. On the islands of New Britain, it was ranked by villagers as their most important fruit and nut bearing tree. Breadfruit does not produce fruit in a regular manner in most of PNG and the production period varies from year to year, despite many statements about its ‘seasonality’. The exception is in Milne Bay Province at 8–11° south where villagers give the producing period as commencing in October or November. Production is likely to be seasonal at locations south of about 8° latitude, but is irregular at most locations in PNG, which are nearer the equator. Such a pattern would arise from the changes in day length during the year with increasing distance from the equator. An estimated 2.4 million rural people grow breadfruit, which represents 57% of the rural population. Breadfruit nuts are widely eaten throughout the lowlands, especially in Momase Region. The flesh is eaten on most islands in PNG and in a limited number of locations on the New Guinea mainland. Nuts are commonly sold in markets in Momase Region. It is possibly now a less important food item than before the widespread adoption of sweet potato, cassava and Xanthosoma taro in the lowlands. It is not clear whether there is potential for further commercial sale of fruit and nuts within PNG. Fresh breadfruit is exported from Fiji to New Zealand and volumes grew rapidly over the period 2001–2005. There is little prospect of exporting breadfruit from PNG because of fruit fly infestation, but there may be a market for some fresh fruit in Port Moresby at least. Planted karuka (Pandanus julianettii), and a wild species (P. brosimos), are the most important of a number of pandanus species that produce edible nuts in PNG, all of which grow above 1000 m. Planted karuka is grown by almost half the rural population. It grows in an altitudinal range of 1800–2600 m, confined mainly to a band in the central and fringe highlands and the Huon Peninsula. Kernels (nuts) of karuka pandanus are an important seasonal dietary item for those living at high altitudes in the New Guinea highlands. The kernel is eaten raw or cooked by roasting it in an open fire, baking in hot ashes or steaming in a stone oven. The nuts can be preserved by drying and smoking above a house fire. For longer storage, the kernels are extracted and stored in baskets hung in house rafters. Smoke from the house fires imparts a characteristic flavour to the nuts. When the nuts are in season, entire households and their domestic pigs migrate from villages to high-altitude bush camps for weeks to harvest and eat the nuts. When sweet potato is scarce because of frost damage or other causes, villagers depend upon karuka if it is in season. The nuts are highly nutritious and provide both protein and oil, the two components that tend to be deficient in highlanders’ diets. Production is irregular in the western part of the highlands, where rainfall seasonality is slight or absent. In the eastern part of the highlands, where rainfall is seasonally distributed, production is more seasonal, but there is still large year-to-year variation in the harvest size. In any year the producing period also varies between locations. The nuts are most likely to mature during January–March, but nuts may mature during any month of the year. After periods of soil moisture stress or drought, the producing periods coincide at most locations. The biggest harvests tend to follow major droughts. Planted karuka is endemic to New Guinea and was domesticated there, probably from the wild species (P. brosimos). Surveys indicate that a significant proportion of village trees are immature, which suggests that people are making new plantings. Karuka nuts are commonly sold in highland markets, either cooked or uncooked. Wild karuka (Pandanus brosimos) is eaten by about a third of the rural population. The kernel (nut) of wild karuka is an important food for villagers living at high altitudes in New Guinea, although it is not as important as planted karuka. Kernels are eaten both cooked and raw. This species is widespread in highaltitude locations (2400–3100 m) in the central and fringe highlands and the Huon Peninsula. Although its range overlaps with planted karuka, wild karuka grows above 2800 m, the altitudinal limit of settlement and food gardens. When fruit matures, villagers migrate to high altitudes to harvest the fruit and extract the nuts. Nuts are produced in an unpredictable manner. They are most likely to mature in January–February, but may mature in any month. The producing period may coincide with that of planted karuka in nearby locations at lower altitudes, but not always. Wild karuka is endemic to New Guinea and is not found elsewhere. Nuts have not been recorded in the main highland markets, but it is possible that they are sold in some high-altitude locations. Galip (Canarium spp.) is grown by almost a third of the rural population. 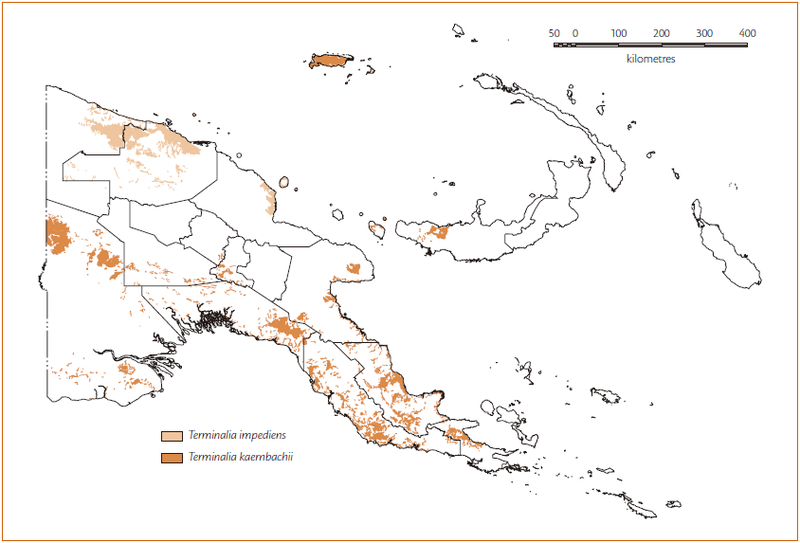 A number of species bear edible nuts in PNG, with Canarium indicum being the most important. The kernel of galip is generally eaten raw, and occasionally roasted. Trees are grown from protected self-sown seedlings or planted seedlings. It is estimated that there are one million edible Canarium trees in PNG, with kernel production of tonnes per year. Galip grows from sea level to 700 m altitude and is widely grown in forested locations below 500 m altitude along the north coast and inland areas of the New Guinea mainland and in the Islands Region. Nuts are produced seasonally with the producing period typically about three months long. Latitude has a strong influence on the start of the harvesting season. Nuts usually mature from April–June onwards at 4–6° south, with the harvest commencing progressively later at locations further from the equator. Canarium indicum is the oldest domesticated nut species in PNG. It has been identified in the archaeological record as early as 14 000 years ago, several thousand years before the start of arable agriculture in New Guinea. The distribution of this species in the archaeological record suggests that domesticated varieties were being moved between islands thousands of years ago. It is a direct link to an earlier era of hunting and gathering in New Guinea’s past. There are indications that consumption is declining. For example, puddings made from galip and taro in some locations such as Bougainville Province were once common but are rarely seen now. Nuts are traded in some locations, for example, from Boisa Island to villages near the mouth of the Ramu River in Madang Province (in exchange for sago); on Vokeo Island north-east of Wewak, East Sepik Province; and Siassi Islands in Morobe Province. Again, there are indications that this trade has diminished in recent decades. Potential for commercialisation of galip nut is considerable and the potential international market for galip nut is large. One unsuccessful attempt to commercialise galip was made in the Kandrian area of West New Britain Province. This was done as part of the AusAID-funded Kandrian Gloucester Integrated Development Project in the 1990s and the operation failed as soon as donor support ceased. The seed of Polynesian chestnut is cooked prior to consumption. It is cooked by baking the entire fruit or boiling or roasting the nut. Polynesian chestnut is found near villages, rivers and in or near food gardens at low altitudes. It is distributed from Java and Borneo in the west through New Guinea and the island chains as far south as New Caledonia and as far east as east Polynesia. Within PNG, it is grown in the lowlands of the mainland and island provinces. It is not common on the New Guinea mainland, except in Milne Bay Province, where it is important on both the mainland and on all larger islands. Polynesian chestnut is also commonly grown on New Britain and New Ireland. Polynesian chestnut grows from sea level up to a mean of 400 m, and occasionally as high as 870 m in PNG. 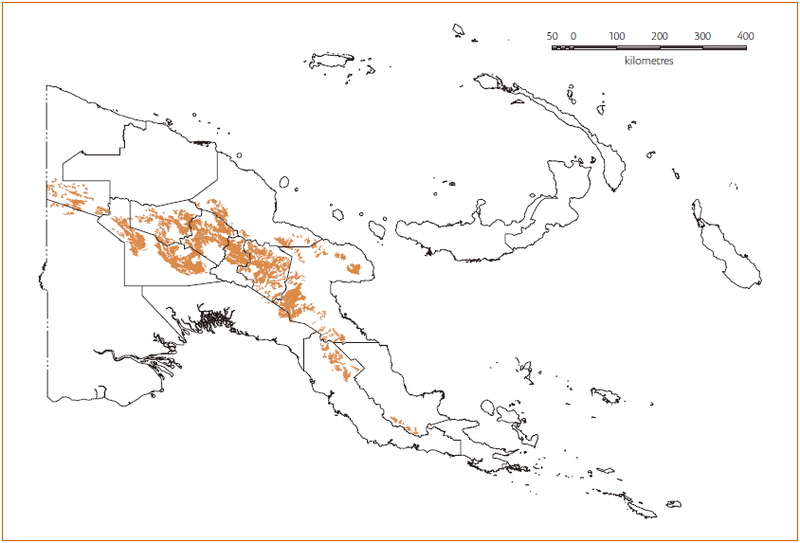 Production in PNG is discontinuous and non-seasonal at locations closer to the equator. In Milne Bay Province (8–12° south), fruit ripens seasonally over a two to three month period, especially in November–February. The MASP database indicates that 637,000 people live in locations where the crop is commonly eaten (15% of the rural population). Most (83%) of those people live in Milne Bay, East New Britain, West New Britain and New Ireland provinces, with the rest in the other lowland provinces. In most locations, Polynesian chestnut is only a moderately important food. It is most important in Milne Bay Province, where it is available on a predictable seasonable basis during the period when garden food is scarce. However, since the widespread adoption of sweet potato and cassava, it seems to have become a less important food there, as the tuber vegetables are available throughout the year. The decline in the importance of the nut as a food is a Pacific-wide phenomenon. Cooked nuts are sold occasionally in markets in the islands in PNG. Polynesian chestnut is not a popular food with those who did not grow up eating it. For that reason, it is unlikely to have great potential for commercial production within PNG or overseas. Evans (1996b:72) notes that standard techniques for the removal of the toxins need to be developed for commercial production. Sea almond (talis) is grown by 13% of the rural population, but this figure overestimates its importance as it is a very minor food in most locations where it grows. The small kernel is eaten raw or roasted, mostly by people who live near the seashore, particularly children. Sea almond is widely distributed along the coast of all lowland provinces up to 300 m altitude and is most common in Milne Bay Province and the Islands Region. It is sometimes planted in coastal and inland villages and has also been planted as a street tree in a number of PNG towns. Sea almond fruits sporadically throughout the year near the equator but is seasonal at locations further from the equator, where fruit ripens sometime between November and May. In Milne Bay Province the producing period is reported by villagers as 2–3 months long, with fruiting most commonly around December–February. Sea almond has a widespread natural distribution in near-coastal areas of the Indian Ocean, throughout coastal tropical Asia and the Pacific Ocean. It has been eaten in PNG for a long time. The fact that superior types exist, including soft-shelled types on Iwa Island in Milne Bay Province and on Mussau Island north of New Ireland, indicate that people have selected superior varieties over a long period. Nuts are not sold in PNG markets. The species has potential for commercialisation for sale within PNG and overseas. It is processed for sale in Vanuatu. Pao (Barringtonia procera) is grown by 13% of the rural population. The kernel is eaten either raw or roasted. 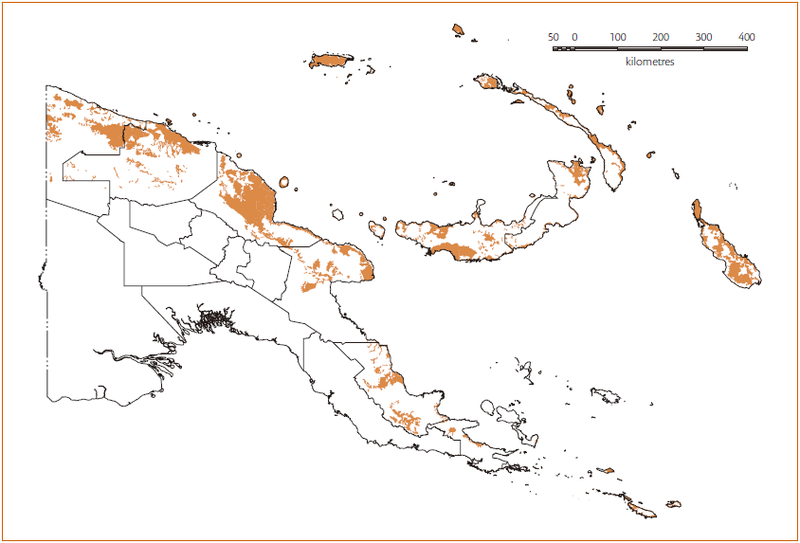 Pao is planted in coastal and inland locations up to an altitude of 500 m. It has a limited distribution within PNG, being confined mainly to the Islands Region. Pao was probably introduced to PNG from Solomon Islands. It is increasing in importance and since about 1960 has been planted at other locations on New Britain and the New Guinea mainland, including coastal and island locations in Morobe, Madang, East Sepik, Sandaun and Milne Bay provinces. Pao fruits intermittently in a non-seasonal manner. It is an important edible nut in the Islands Region and is sold in markets there. Edible Barringtonia species have been commercialised in Vanuatu, where there is high demand for the nuts. Barringtonia procera in particular has considerable potential as a cash crop for both the domestic and export markets, given the small area required per tree, a relatively short time to maturity and the possibility of growing it as a horticultural crop rather than relying on naturally occurring forest trees. Two related species, B. novaehiberniae and B. edulis, bear edible nuts in PNG, but they are very minor foods. Okari (Terminalia kaernbachii) is grown by about 12% of the rural population. The name okari is used in Motu (and now English) in the Southern Region for T. kaernbachii, but it has been adopted in Tok Pisin as the name for the related T. impediens. The former is a more important food and has significant commercial potential, whereas the latter is a minor food with limited commercial potential. Okari (T. kaernbachii) nuts are eaten raw. Trees are preserved in garden land or planted. Villagers either harvest nuts from trees or, more commonly, collect the fallen fruit. 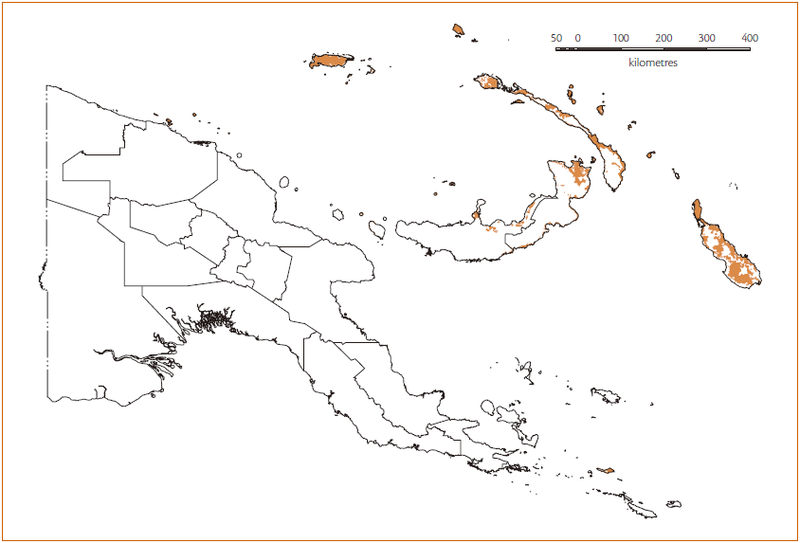 Okari is mainly distributed in the Southern Region but also occurs in adjacent locations in Southern Highlands, Simbu and Morobe provinces; in Manus Province; and in West New Britain from the Aria River west to Cape Gloucester. Okari was domesticated in New Guinea. Over the past 50 years the tree has been introduced to other locations in PNG, including East New Britain and New Ireland. It grows from sea level to 1100 m altitude. The species is uncommon near the ocean in its natural range in southern New Guinea, although it does bear near the ocean at, for example, Keravat on New Britain and Kavieng on New Ireland. It may be that the best production occurs where the diurnal temperature range (the difference in temperature between day and night) is greater. The producing period is fairly constant from year to year and lasts for 2–4 months, although the size of the annual harvest is variable. There is a clear relationship between latitude and the start of the harvesting period, with the producing period commencing later at locations further south from the equator. This is presumably caused by differences in daylength, although it could also be related to seasonal temperature changes. Nuts mature from about March at 4° south and later at locations further south. Okari nuts are eaten in the producing region and some are sold in local and regional markets, including in Port Moresby. Okari nut has considerable potential for sales within PNG and overseas. A local non-government organisation, Okari Ecoenterprises, attempted to commercialise okari nut on the Managalas Plateau in Oro Province in the early to mid 1990s. Nuts were collected from planted and self-sown trees and transported to Port Moresby where they were sold through Associated Distributors. The operation failed after a few years because of an irregular supply of nuts. Okari (Terminalia impediens) is grown by about 8% of rural villagers, but this figure overemphasises its importance as it is a minor food where it is grown. The kernel is eaten raw. Trees are not planted, but are preserved when land is cleared for gardening. This species grows up to 1000 m altitude and is common in East Sepik, Sandaun and Madang provinces. Terminalia impediens was domesticated in New Guinea. Production is not expanding. The species is not sold in fresh food markets and probably has less commercial potential than the closely related T. kaernbachii because the nuts are smaller. Sis (solomon) (Pangium edule) is grown by 8% of the rural population and is widely eaten in PNG, despite requiring extensive processing to remove a poison. The seed is eaten only after being washed in water, then roasted and fermented. Pangium edule is known by the common name sis in some locations in Momase Region and solomon in parts of New Britain. It is grown in most provinces, being most commonly eaten in Milne Bay. Sis grows from sea level to 1050 m altitude in both coastal and inland lowland locations. Production is seasonal, commonly starting around May or June and lasting 2–4 months. Sis is an ancient crop in PNG. It was probably a more important food before the widespread adoption of introduced foods including sweet potato, cassava and Chinese taro. It is occasionally sold in fresh food markets. Because of the extensive processing required to make the nut safe for human consumption, it is unlikely that this species has any commercial potential. This species has been described as ‘… one of the great domesticated multipurpose trees of the worlds’. The seed can be eaten after being roasted. Consumption of raw seeds results in nausea and vomiting. Candle nut is native to the Indo-Malaysia region and was introduced in ancient times throughout the Pacific islands. Its pre-European distribution was from India in the west to the Marquesas Islands in the east; and from Australia in the south to Guam and China in the north, including New Guinea and associated islands. It has now been introduced to much of the tropical world. It is widely distributed throughout PNG, where it grows from sea level up to a mean of 1800 m and occasionally as high as 2160 m. The limited information on the production pattern from Simbu Province, the Goroka area, New Ireland and New Britain indicate that fruit ripens seasonally between August and December. area of Eastern Highlands Province and in the Morehead area of Western Province. The MASP database indicates that it is eaten by only about 8000 people. Nuts are occasionally sold in food markets in Simbu Province and in Goroka market. fodder and as a dye. It is unlikely to be adopted as a food in PNG, but candle nut oil may have commercial potential for export. Castanopsis kernels are eaten either raw or cooked and are gathered from self-sown or planted trees. Henty (1982:80) reports that, in the Pomio area of inland New Britain, seeds were commonly eaten after boiling and that some children, against the advice of their elders, persistently ate raw kernels. Millar and Dodd (1982:201) compare the flavour to a walnut. The global distribution includes parts of India, China, Burma, Taiwan, Thailand, Vietnam, Laos, Indonesia and New Guinea. Within PNG, the species is widespread on the New Guinea mainland, especially in the highlands and nearby locations, including in the Wau area of Morobe Province. It grows in the interior of New Britain and on some of the islands of Milne Bay Province. Castanopsis grows from a mean of 700–2350 m, and occasionally over the range 570–2440 m.
The nuts are available seasonally, with a producing period of about two months that commences at some time between July and December. The limited available data suggest that the producing season commences earlier (July–September) at lower altitudes (800–1200 m) than at higher altitudes (1600–2000 m), where it commences in November–December. Castanopsis is eaten in parts of the highlands, the highland fringe and in the interior of New Britain. The MASP database indicates that about 293,000 people live in locations where the crop is commonly eaten (7% of the rural population). Most of those people (75%) live in Southern Highlands Province. Generally it is a minor food in PNG and is not seen as having much commercial potential. Dausia is a minor species where the nut is eaten only after elaborate processing, which usually involves the fruit being soaked in water for some days. French (1986:172) reports that the outer flesh of the fruit is eaten and that a selected yellow-fleshed form is eaten in the Solomon Islands. The species is moderately common in the islands of Milne Bay, including Misima, Rossel, Sudest, Engineer Group, Calvados Islands, Trobriand Group, Iwa and other nearby islands. Dausia is a lowland species, and its upper altitudinal limit is not known. Nuts are available seasonally in the period December to February. The MASP database indicates that 88,000 people live in locations where the species is commonly eaten. This is 2% of the rural population and all are located in Milne Bay Province. As far as I know, it is not sold in food markets. Finschia is a minor species. Nuts are gathered from self-sown trees and eaten raw. Henty (1982:81) notes that trees are sometimes planted near villages. The species is related to macadamia. Finschia is distributed through New Guinea, Solomon Islands, Aru Islands, Vanuatu and Palau Island (Micronesia). Within PNG, it has been recorded in Morobe, Eastern Highlands, Southern Highlands, Western, Gulf and Milne Bay provinces. It no doubt occurs elsewhere in PNG. Finschia grows from sea level up to a mean of 1850 m, and occasionally as high as 2000m in PNG. Production is reported to be seasonal, but there is insufficient data to generalise about the pattern. While the species is widely distributed in PNG, it is a very minor food, the nuts of which are eaten by some people occasionally. I have never seen nuts sold in food markets. It is not clear whether this species has any potential for further domestication or commercialisation. I would like to import The Galip Nut into Australia for private consumption. What requirement/s do I need to provide, ie; Import Licence etc. ?